It's been just over two weeks since I wrote this post, where I reintroduced my goals posts. In case you missed that post (you should read it now, it's a good one, I promise) I basically talked about how I wanted to start setting myself goals again but this time around I wanted them to be simpler, more achievable and I wanted to write a post at the start of every month. It will be the same as my seasonal goals, so I will talk through my goals from the previous month and see how I got on with them and then I will discuss my new goals. Do something blog related every day. This was a very important one for me because my blog is something that keeps me motivated and reminds me that I'm not a complete failure. Although I didn't actually blog much (I wrote two posts UGH) I do think I achieved this goal. I've been working a lot harder on my Instagram this month, taking specific pictures just for Instagram and using my Instastories. I've been really enjoying it as I find that Twitter has become somewhere too negative for me to deal with and blogging can be too overwhelming at times. I'm having so much fun on Instagram and you should follow me (shameless!). Go outside every day. Thanks to the amazing weather we had for a few days here in Galway I got outside more than enough. I felt so good the days I spent all day in the sun. Of course, there was some days I just about went to the shop but I think I did better than I would most months and this is something I'm definitely going to continue doing well into the summer. Drink more water. Last month I touched briefly on how bad my skin had gotten and this was one of the reasons why I wanted to drink more water. I wouldn't say I've greatly increased my water intake but I have started drinking more than I had been. I'm not sure if it's the water, the fresh air I've been getting or the products I've been using but my skin has improved immensely. Do yoga. As I said, doing yoga in college is hard. I did yoga, maybe once, this month when I went home. However, I'm back at home for three weeks so I know I'll get back into the swing of things. Spend time getting ready in the mornings. Almost every day this month I did my make up and wore clothes I actually liked. It made the day a lot easier and I actually looked forward to getting out of bed. So, all in all, I think I did pretty okay with my goals for March. Completing them made me feel a lot better, even thought they were very simple. 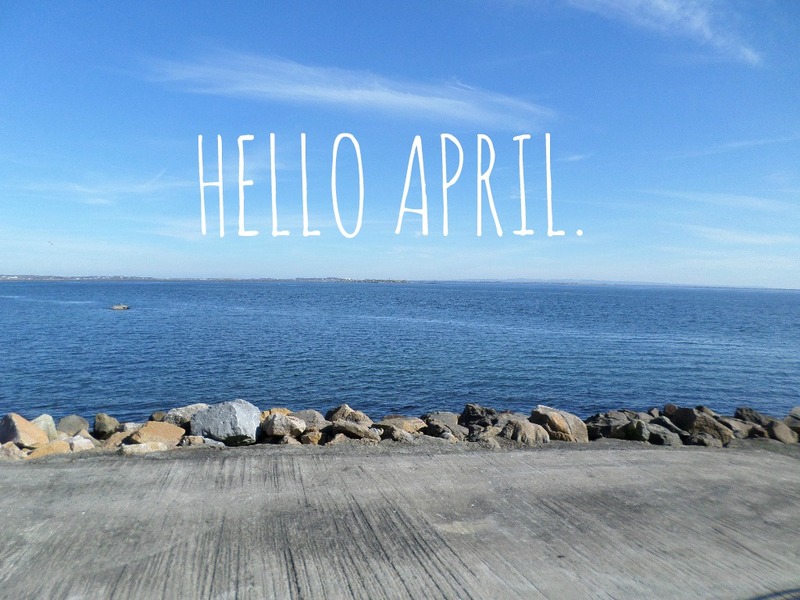 Without any more rambling, here are my new April goals! When the weather was good, I got out a lot and it really improved my mood. During the sunny weather I was doing almost 20,000 steps every day which is TWICE the healthy amount. Because I'm the least active person, possibly ever, it's actually pretty difficult for me to reach the 10,000 BUT I'm going to try hard every day to reach my goal. I've got a lot of posts planned for my blog this month and because I'm off for three weeks I have a lot of time to work on it. I've recently lost my love for blogging but I'm slowly working on getting it back and I am excited to get back into it. I've been having a hard time finding the good in things recently. I tend to think it's the end of the world when one small bad thing happens and I often forget to focus on the happy things. I love reading. I used to get through at least one book a week but I haven't had the chance to read in a while. This month I want to get back into my love for reading because it is so lovely to get lost in a good book. I am THE WORST sleeper ever. I am a night owl and could spend hours staring at the ceiling at night. I tend to try to reorganise my entire life late at night (I'm not the only one, right?) Since coming home from Galway I've been waking up at 9AM every morning and I feel so much better. Now all I have to do is sort out my night time routine and stopped staying up past 4AM... I just need to finish Jane the Virgin first. Once again I've set very simple, easily achieved goals. I'm focusing on becoming a better version of myself. My main goal is to get back to feeling myself again and I think completing these goals will help me towards reaching that final goal.